Distressed Real Leather adds a stylish touch. Inside Viscose Lining brings in amazing comfort. Two Zipper Pockets, Two Side Pockets and Two Inside Pockets plenty of options to store your precious items. Snap-Tab Collar with Front Zip Closure adds to overall fitting and style. I can’t get enough of contraband jacket. I need to get a T-Shirt with contraband jacket on it so I can show it off to everybody. I just had a word…Awesome!!! Grab an outfit that gives you countless compliments on any style. 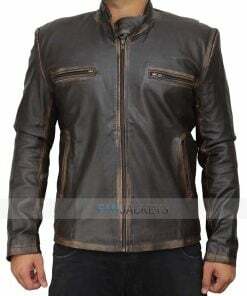 The distressed brown leather Jacket worn by Mark Wahlberg is our exclusive collection redesign only for you. 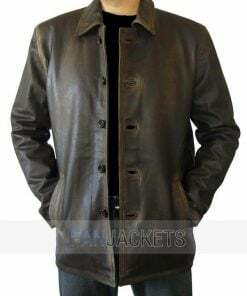 From the movie “Contraband” this stylish attire is made to give you an eye catching attraction. Made in a significant manner by our makers. 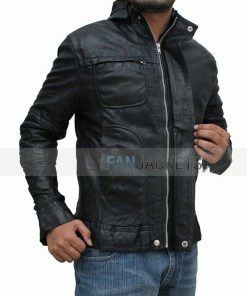 Mark Wahlberg leather jacket offers you a complete style statement.Grab it to get noticed among your friends.